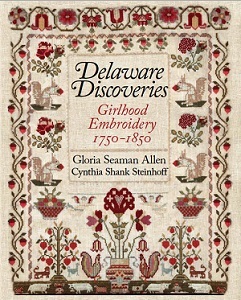 Available for pre-order: Delaware Discoveries: Girlhood Embroidery, 1750–1850. Scholars, collectors, curators, and makers who are interested in the history of samplers will all benefit from the extensive and extraordinary information to be found in this 440 page, full-color tribute to the talented women in Delaware during the 18th and 19th centuries. The book will ship when it arrives in stock around April 1, 2019.